X-Large - $139.99 Only 9 left! What does it take to be a leader? Wisdom? Groundbreaking ideas? A lot of money? While we'd like to think that our leaders have a lot of the first to, often people end up at the head of a conference rooms table or behind a podium because of their likeability. That's right, you've known it since middle school, the popular kids rule the world. Take Jack Skellington, for example. He might be good at his job. Scaring people is pretty simple when you're a skeleton after all. But taking off your head to recite Shakespearean quotations isn’t that much of a scare, it's strange, sure. Say you walk in a skeleton holding its head, quoting Hamlet. Once you got through the "To be or not to be" part and listened through to "With a bare bodkin? Who would fardels bear" you wouldn't be afraid, only confused. What was Shakespeare even talking about? So, the point is Jack got his position of pumpkin king because of his charisma, and now you can take on some of that popularity, too! Simply pop on that head that he was so fond of taking off and you might find your confidence rising at a rapid rate. 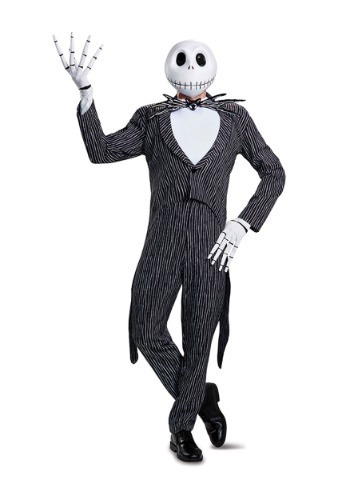 This Jack Skellington ensemble doesn't cut corners, everything that makes Jack's image so compelling has been included, except perhaps his bony dog, Zero. The suit with its coat tails has that hand drawn pin-striped look of the movie, along with the batty bow-tie. You'll even have Jack's long fingered gestures, perfect for a dramatic skull juggling session. One thing is for sure, with a costume this charming, there's no doubt who the pumpkin king of Halloween will be this year.